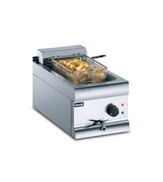 Electric counter top fryers are a fantastic versatile and mobile option for small catering operations, or for larger businesses who need to increase their frying capacity in peak seasons or without taking up extra floor space. 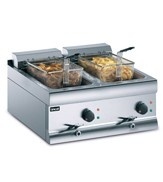 A separate counter top fryer is also a good option for caterers who wish to keep certain fried foods separate, for example vegetarian food. Catering Appliance Superstore stocks models from Lincat, Falcon, Apollo and many more quality fryer manufacturers, between them providing a great versatile range of single basket, twin basket, single tank or dual tank countertop fryers in a range of prices and specifications.